Soon after Painter's discovery of giant chromosomes in salivary glands of D. melanogaster (20-25), Koltzoff was among the first to propose they were multistranded and that chromosome enlargement occurred by multiplication of chromatids (he called them "genonemes") without mitosis (162). Three decades later, Beermann and Pelling (163) provided autoradiographic evidence that the DNA strands of Chironomus polytenes are unit chromatids, apparently extending the entire length of the polytene structure. ~45% of nuclei at 1024C ~30% at 2048C ~10% at 512C ~1100 "chromatids"
a415C would be equivalent to the 512-chromatid class when adjusted for underrepresentaion of centric heterochromatin [Rudkin (68) estimated approx 22% of the female genome is heterochromatic]. b Anterior-posterior ploidy gradient with posterior nuclei tending to be of higher ploidy. Numerous studies have attempted to measure polytene levels in various tissues of D. melanogaster, in other Diptera, and in certain other organisms where polyteny occurs (reviewed in ref. 152). Table 3 lists some of the quantitative studies done on tissues of D. melanogaster, most of which used Feulgen cyto-photometry to measure DNA amounts (see Chapter 7). The maximum level of polyteny estimated for wild-type D. melanogaster salivary glands is 1024-2048C (i.e., the two homologs having undergone 9 or 10 rounds of replication each), and regional differences in ploidy levels can exist within a gland (172). Note, however, that even 2048C is puny in comparison to the polytene levels observed in some chironomid salivary glands, up to 16,000C (152,171,175). Polytene levels in other D. melanogaster tissues are typically substantially lower than those in salivary glands, with the exception of nurse cells (see Table 3; also see Chapters 6 and 7). In a cross-sectional scanning electron microscopic view (22,500x magnification) of a salivary gland polytene chromosome from D. melanogaster, Iino and Naguro (169) counted approx 1100 fibers, 12-20 nm in diameter, that they assumed were chromatids—a number consistent with cytophotometric data. Urata et al. (176) used wide-field optical microscopy to study DAPI-stained polytene chromosomes preserved in three dimensions. Punctate DAPI staining was observed in cross sections of bands, suggesting that chromatids are bundled. The number of such bundles in the 39 bands analyzed ranged from 25 to 53 (mean = 36 ± 7). Bundles were of varying intensities, circular or ellipsoid in shape, and approx 0.2-0.4 ^m in diameter (this is close to the resolution limit of the light microscope so that bundle size may be smaller) (176). Assuming 1024 chromatids per chromosome, each bundle would contain approx 20-40 chromatids. In tracing the bundles for several microns along the chromosome axis, they appeared to be continuous and were sometimes seen to merge with and split from one another. Similar results were obtained for cross sections of interbands. 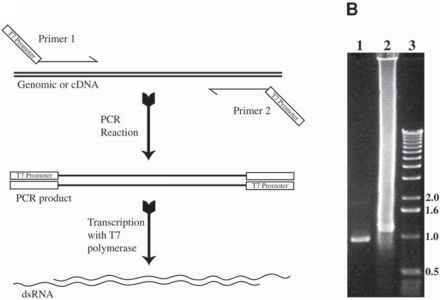 For these experiments, however, antibodies against a subunit of RNA polymerase II were used to highlight interbands because, unlike bands, they are stained poorly by DAPI. [Anti-RNA pol II antibodies localize to interbands and puffs (177), and RNA pol II staining does not overlap with DAPI-bright bands (176).] These authors also observed that polytene chromosomes have a cylindrical shape (and actually toroidal at the Notch locus) when viewed in cross section. Antibodies against histone H1 stain both bands and interbands (puffs are stained less intensely) (178). This suggests that the 30-nm nucleosomal filament (see ref. 179), which is H1 dependent (or facilitated), is a common structural element of both bands and interbands. tids) show discrete fibers in interbands oriented parallel to the chromosome axis (164) (see also Chapter 15). Individual fibers separated by approx 30-50 nm were seen to have an irregular beaded appearance suggesting nucleosomes (approx 10-30 nm including Pt coating). Electron microscopic (EM) analysis of polytenes of first and second instar larvae revealed specimens with approx 25, 50, 100, and 200 fibers in interbands, close to the expected geometric progression 25, 26, 27, and 28, and that all interbands of a given chromosome have the same number of fibers. In interbands at higher levels of polyteny and in bands, it was not possible to make direct counts of fibers by EM, and the ultrastructure of bands was too complex to interpret (164). Images of squashed D. melanogaster salivary gland polytene chromosomes obtained by atomic force microscopy revealed discrete classes of parallel thin fibers in interbands, roughly 11, 30, and 200-250 nm wide, sometimes associated with regularly spaced "dots" (12 ± 3 nm wide), possibly nucleosomes (180). Higher squashing forces applied to interbands caused stretching and revealed additional thin fibers, whereas banded regions were largely unaffected by squashing. Seven-hundred-nanometer-wide fibers were observed in interbands of unstretched chromosomes and apparently also in bands. De Grauw et al. (180) suggest a hierarchical structure in which 11-nm "nucleosomal" fibers aggregate into 30-nm-thick then 240-nm-thick fibers, and, finally, into 700-nm-thick fibers. The 240-nm fibers were often found to have a cablelike appearance, suggesting they are coils of thinner fibers. A 110- to 130-nm-wide fiber was also sometimes observed, but its relationship to the others is unclear. It also remains to be determined whether the 700-nm (or other size) fibers seen by de Grauw et al. (180) and the bundles observed by Urata et al. (176) are the same polytene substructure.